Brian leads our discussion of electric vehicles in this episode of The Engineering Commons podcast. Carmen notes that a single resting electron has a mass of 9.11 x 10-31 kilograms. Brian suggests some form of positronic vehicular propulsion might be possible, although radiation issues would make it impractical for most earthbound applications. One of the currently available electric hybrids is the Cheverolt Volt. Adam notes the Volt’s drive arrangement is similar to that of a diesel electric locomotive. Electric vehicles were first invented back in the mid-19th century. Although gas vehicles were less popular than either steam or electric vehicles in 1900, the gas engine was clearly established as the market leader by the 1930s. At one point, Ford suggested it might build a nuclear-powered passenger vehicle, the Ford Nucleon. 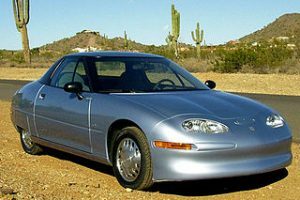 General Motor’s entry in the electric vehicle field, the EV1, was made famous by the 2006 documentary Who Killed the Electric Car? Although not a “pure” electric vehicle, the Toyota Prius has been a popular electric hybrid. The first highway-capable electric vehicle mass produced for sale in the United States was the Tesla Roadster. Smaller gas pump nozzle diameters were introduced as automobiles transitioned from leaded to unleaded gas. Differing interfaces exist for charging electric vehicles. A common connector for charging electrical vehicles in North America is defined by the SAE 1772 standard. Tesla is building its Gigafactory 1 to produce lithium-ion batteries in high volume. A recent death in an auto-piloted Tesla will challenge the emerging self-driving vehicle industry. Some states are levying “green car” taxes to make up for lost gas tax revenues. Tesla has recently purchased solar power provider SolarCity. The U.S. Department of Energy provides a webpage that estimates emissions, on a state-by-state basis, for the electrical power used to operate electric and hybrid vehicles. Thanks to Wikimedia Commons for use of the photo titled “General Motors EV1.” Opening music by John Trimble, and concluding theme by Paul Stevenson. Am currently listening to your podcast. Thanks for not buying into the conspiracy theories on the GM EV1. I was on that project for two years (vehicle structure). When I read The Innovator’s Dilemma I felt it really explained what happened to that project.